Now that I have finished up with my Cup Of Bead Soup, I wanted to share a bit of my journey with my addiction. Now I have never thought of myself as a creative person. Always thought that I had my feet just too firmly on the floor to be able to imagine and then create anything. Since both of my husbands have been artists this kinda bummed me out but I figured that it was my lot in life to support not create. But then lightening struck. Or actually it was a beading kit that I picked up at One Spirit to work on while we were slow at work. Just that one kit and I was hooked. I really wish that I had taken pictures of my earlier pieces just so that I could see how I am grown but I do have a few. This is a bracelet that I did a few years ago for a friend using copper and smokey quartz. Just simple stringing. 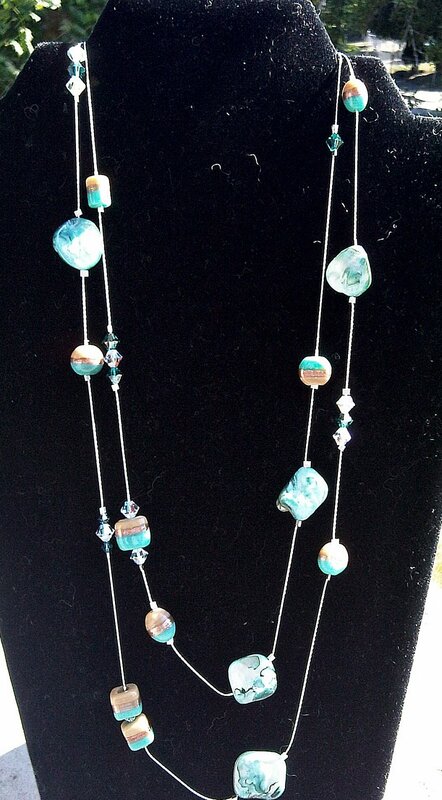 This is one of the first necklaces that I put together using beading chain, some MOP and some ceramic beads. And yes, my pictures were really horrible back then. I sure hope that they have improved somewhat since then. This is a piece I made for a fairy tale bead swap. 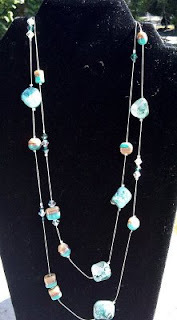 I used copper chain along with pearls and crystals in this necklace. And this one was for a monthly ABS Challenge. 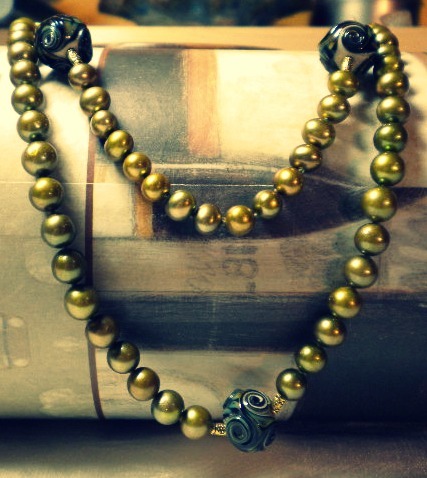 This one is knotted with gorgeous AAA pearls and lampwork beads from BeatleBaby Glassworks. This trip down the memory lane has been fun. It gave me a chance to see how I really am improving. And now that I have a good camera, the pics for this upcoming Bead Soup Blog Party should be all the much nicer. Also it occurred to me while I was scheduling this post that it really is a good time to look back as today is my birthday. You do beautiful work even in the beginning. Thank you for sharing how you got started.